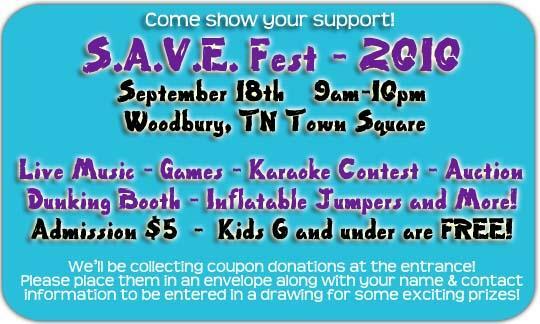 A day full of fun is planned in Woodbury Saturday when S.A.V.E. Fest 2010 takes place on the Town Square. Featured festivities include live music, games, a karaoke contest, an auction, a dunking booth, inflatable jumper and much more. SAVE Fest 2010 will begin at 9 a.m. and continue until 10 p.m. Admission is $5. Kids six years and under can attend for free. Donations will be accepted. Cannon County S.A.V.E. is a not for profit 501 c (3) agency geared toward stopping the spread of domestic violence and sexual violence in our community. S.A.V.E., as it appears on state documentation, stands for Service and Violence Education. However, the local agency prefers "Serving All Victims Equally." S.A.V.E. is the only domestic violence and sexual assault agency in Cannon County, and is on the front lines for all victims of domestic violence and sexual assault. S.A.V.E. provides free services for all victims: women, children, men, and senior adults. S.A.V.E. works closely with local law enforcement, the Department of Children's Services, Adult Protection Services, medical personnel, and the local court system. "It is our hope this website will educate and empower the public, while providing crucial, life-saving resources for victims of domestic and sexual violence," Lisa Baird, S.A.V.E. Director, said.